Here's my list, feel free to add your own! 1. 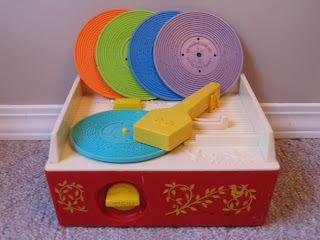 The Fisher Price record player. 3. My entire Strawberry Shortcake collection, complete with the trolley and the bakery. My only regret is that I never owned Sour Grapes. 4. A set of play dishes with a yellow daisy in the center and swirly edges. 6. My Miss Piggy puppet. All the excuse I needed to run around screaming "Hi-yah!" at everyone. 7. My WonderWoman underoos. It took a little finesse to undress while spinning in circles but I managed it (mostly).